‘Entertainment’ promotions on Entertainment Ke Liye Kuch Bhi Karega. 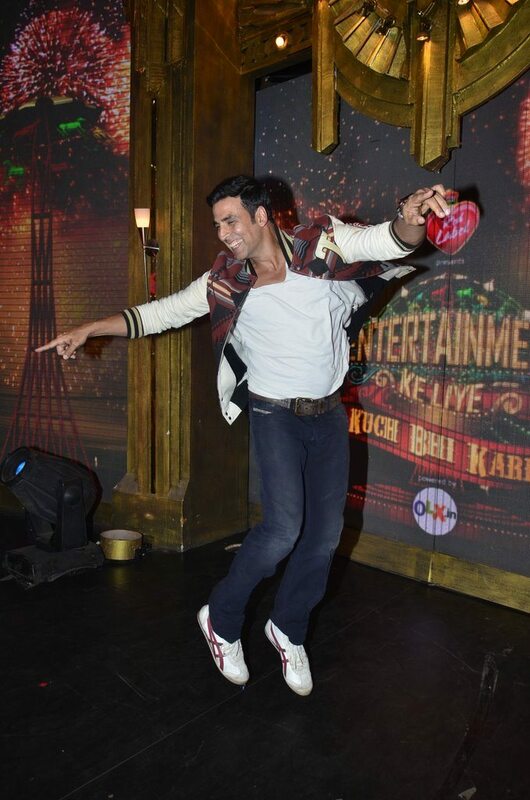 Bollywood actors Tamannah Bhatia and Akshay Kumar appeared on the sets of ‘Entertainment Ke Liye Kuch Bhi Karega’ to promote their upcoming movie ‘Entertainment’ in Mumbai on July 22, 2014. ‘Entertainment’ has been directed by debutant duo Sajid-Farhad who have previously worked on various other Bollywood films. The movie was earlier titled as ‘It’s Entertainment’, but the makers recently decided to change the title owing to a clash with an already registered movie name. The shooting for the film began on June 3, 2014 in Mumbai. The songs of the film have been composed by Sachin-Jigar. Entertainment has been produced by Ramesh S Taurani of Tips Industries Ltd and is all set to be released on August 8, 2014.